The Chic Mompreneur: Philippine Airlines Flight for only Php1592? Is it possible to purchase a Philippine Airlines flight for only Php1592 (One Thousand Five Hundred Ninety Two Pesos) only? Last November 4, Philippine Airlines launched a new product called the PAL Econolight Class. It offers Philippine Airlines flights for budget travellers on all its domestic jet routes and selected short-range routes. Seats for these Philippine Airlines flights are on allocation. Better book early if you want one. It's said to be up to 93% cheaper than Fiesta Class (economy) fares, and I got to find that out for myself today. I went online to book a Cebu-Manila-Cebu flight for December. First of all, I checked Cebu Pacific to see if I could rebook an existing ticket. 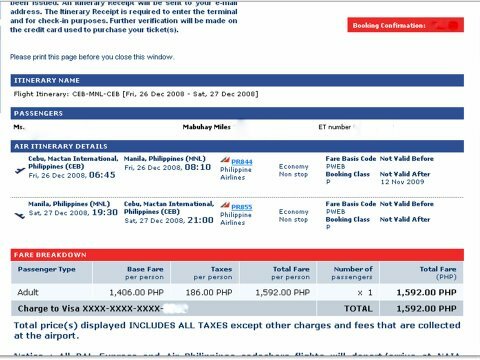 With all the fees, I was required to pay more than Php2000 to rebook the flight to December. I decided to check out Cebu Pacific's online site to see their normal flight fares for the time period. A Cebu-Manila-Cebu roundtrip flight from Cebu Pacific costs more than Php4000! Their rates are pretty deceiving. They post Php4 on the fares page, but they bloat it to almost Php2000 once you check the final amount with the taxes. Next, I checked Philippine Airlines. These days, it's always best to check the two competing airlines to get the lowest fares. Don't you think it's a GREAT deal? It costs less than a one-way ticket from Cebu Pacific! For more info on Philippine Airlines' Econolight product, click here. super great deal gid! i feel bad now i bought dec 26 tickets for P4,000 each. sigh. It is great stuff indeed.